What makes a resignation stick? Question: What should we do if an employee clearly resigned — with a written resignation and repeated confirmation — but was later diagnosed with depression and anxiety and claimed she wasn’t thinking clearly? It wasn’t evident at the time she had any mental health issues, her position has been filled and we have no positions available for which she’s qualified. Answer: Presumptively, if an employee resigns, it ends the employment relationship. However, there can be exceptions. It is well known that sometimes employees change their minds. In the unionized context, arbitrators focus on whether the employee’s resignation represented the employee’s true intent. Arbitrators have suggested the act of quitting embraces both a subjective intention to leave employment and some objective conduct which manifests a continuing effort to carry out that intention (U.E., Local 512 v. Anchor Cap & Closure Corp. of Canada). Resignations made under duress, emotional turmoil and stress or by persons whose mental condition deprived them of the capacity to make such decisions may be treated as not having had the true intention to resign. In N.B.U.P.P.E. v. New Brunswick (Department of Public Safety), an employee who was suffering depression was not held to her resignation. In this instance, if the employee was unionized, an arbitrator would likely allow the employee to rescind her resignation, but due to the fact the position had been filled, the employee would likely be put on a leave. It should be considered undue hardship for the employer to have to dismiss the replacement employee whom it hired in good faith. With respect to a non-unionized environment, the treatment of a revoked resignation is a little different. 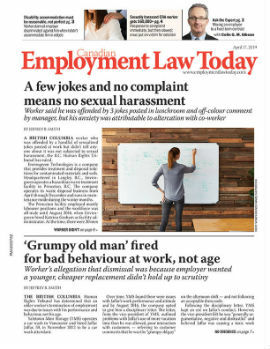 In Kieran and Ingram Micro Inc., the Ontario Court of Appeal said an employee may revoke a resignation so long as the employer has not relied upon it to its detriment. Detrimental reliance is not a condition existing in labour arbitration. In a more recent decision, Reid v. Stratford General Hospital, an employee who had worked for the employer for almost 20 years submitted her resignation. The employee did not provide any reasons for the resignation in her letter — she had been experiencing a great deal of stress, both in her personal and professional life. The employee’s resignation was accepted by letter the next day which was received by the employee two days later. However, prior to her receiving this letter, the employee rescinded her resignation. She indicated she had resigned due to “extreme stress” and she actually had “no intention of resigning from a job in which (she had) invested 20 years.” The employer refused the rescission of her resignation, at which point the employee claimed she had been terminated without notice and successfully sued. The court in Reid relied on this statement and found, since the employer did not rely on the resignation to its detriment, the employer should have accepted the employee’s rescission. Most likely, in this instance — a non-unionized setting — a court would find it would be undue hardship to have the employer place the employee on some form of leave or displace the most recently hired employee, when the employer had taken the employee at her word and relied upon her resignation to its detriment. Therefore, in this scenario, it is unlikely the employer would have to reinstate the employee. Brian Johnston is a partner with Stewart McKelvey in Halifax. He can be reached at (902) 420-3374 or bjohnston@smss.com.